Ultimate Bolivian gov’s international embarrassment! U.S. Ambassador to the U.N. Nikki Haley forced Bolivia to “defend the atrocities of the Syrian regime” in “full public view” on Friday, after the country’s ambassador requested a closed session to discuss President Trump’s strikes in Syria. Trump ordered the missile strikes in response to a chemical weapons attack by Syrian President Bashar Assad Tuesday which killed dozens in northern Syria. Haley revealed the Bolivian ambassador’s request for a private emergency session of the U.N. Security Council in a written statement Friday morning. 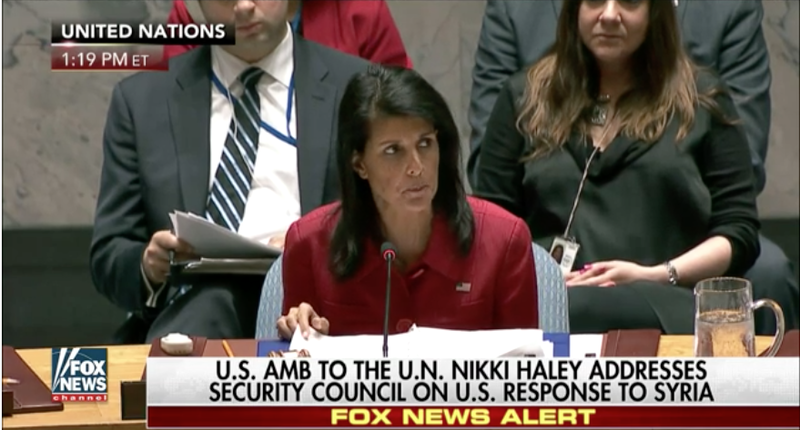 At the session, Haley stood by the U.S. actions, and said that when the international community fails to act, it is up to individual states to act themselves. ”The moral state of the Assad regime could no longer go unanswered. His crimes against humanity could no longer be met with empty words. It was time to say enough. But not only say it, it was time to act,” she said. Haley also questioned Russia’s role in carrying out a deal to remove chemical weapons — arguing that either Moscow knew about the weapons, was “incompetent” in removing them, or was played “for fools” by Assad. She went on to warn that more U.S. action could be on the table. “The United States took a very measured step last night. We are prepared to do more. But we hope that will not be necessary,” she said. The session itself was fiery. Meanwhile Syrian Ambassador Bashar Ja’afari condemned what he called “a barbaric, flagrant of aggression” and a violation of the U.N. charter. “This act makes America a partner of ISIL, Al-Nusra and other terrorist groups,” he said. “We believe it is the duty of the Security Council, of the United Nations organizations, to defend multilateralism … we are here to defend it,” he said. He went on to brandish not only a copy of the U.N. Charter, but also a large photograph of former Secretary of State Colin Powell addressing the Security Council in 2003 about the alleged threat of Weapons of Mass Destruction in Iraq. Soliz went on to argue that there were no WMDs found in Iraq then, and that the council should therefore be skeptical of the United States now. Rycroft also mocked the Russians, saying Assad had “thumbed his nose” at Russia’s calls for Assad to engage in peace talks. “Russia sits here today humiliated by its inability to bring to heel a puppet dictator,” he said. Other members took more restrained approaches. Italian Ambassador Sebastiano Cardi called for the Security Council to redouble its efforts to seek a U.N.-led political transition from the Assad regime, while French Ambassador Francois Delattre said Assad’s crimes should not go unanswered, and renewed calls for the U.N. to take charges to the International Criminal Court – but noted that such efforts have been vetoed by Russia. Delattre called the strikes by America a “legitimate” response and a sign that use of chemical weapons will not be tolerated, but warned that a solution will not be reached by military means alone. My Country has been ridiculed and ostracized due to the inept, demagogue, delusional government of the coca grower caudillo! Before within the OAS and now inside the UN to the world! And all to defend a stupid “ideological” position, this shame only reinforces my idea that this madman “lives” in the past, around the iron-curtain and soviet delusions of grandeur …. to our detriment! This entry was posted in Bolivia, Crime and Violence, Politics, Social Unrest and tagged crime, demagogue, human rights, OAS, United Nations. Bookmark the permalink.